Keep a bit of the water in your existing metal stock tank free of ice with the Allied Precision Tankside Heater/ Deicer. This generous unit installs on the side of your tank easily, helping your livestock obtain water all winter. The top, plastic casing holds the adjustable thermostat, and a significant thumbscrew here allows you to clamp the unit to the side of your tank. The metal sleeve prevents animals from contacting the heater, while the large, stainless steel element rests near the base of the reservoir. Set the adjustable thermostat to operate the unit only when the water temperature around it reaches approximately 43° Fahrenheit, for efficiency and safety. The attached, 65" long cord has a plug at the end, for use with a standard GFCI outlet, and the full unit may be removed from your tank at the end of the winter months. 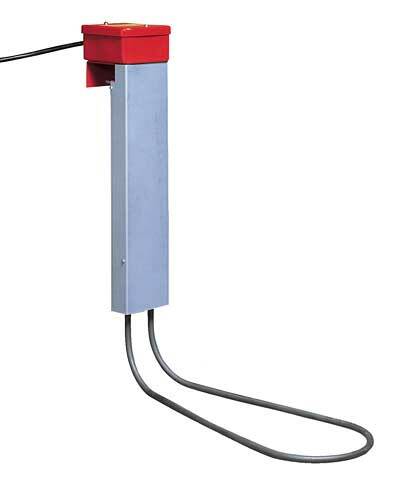 Ensure your livestock have drinkable water available with this Tankside Heater/Deicer.